This article describes how the magnification of the microscope adapter used to mate the camera to the microscope will affect the field of view on the resulting images. In the diagram on the right, the circles represent the field of view seen through the microscope eyepieces. The rectangles represent the image field of view. Each circle corresponds to a certain “field number” (FN) eyepiece. Eyepieces with wider fields have larger field numbers. The field number is usually engraved on the eyepiece right after the magnification, as in WHK 10x/20. In this example, FN=20. Usually the desired field of view in the image is that which most closely corresponds to what is seen through the microscope eyepiece. This is achieved by selecting the lowest magnification adapter recommended for a specific sensor size. However, there are situations that require a higher magnification adapter. Specimens that are blurred on the TV monitor are better resolved at a higher magnification by utilizing more pixels on the monitor. This is especially useful when using a 100x objective which is usually the highest available microscope magnification. A higher magnification adapter may also be useful when using a non-flat field objective. This enables the user to image only the center (in focus) portion of the image. It is sometimes useful to determine whether a specimen will be fully visible in the images. The portion of the specimen that is visible does not vary with the size of the monitor display. 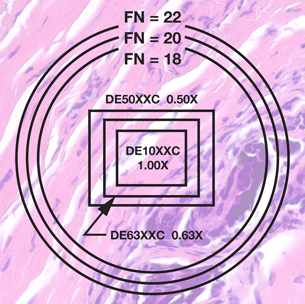 The field of view size varies with changes in CCD sensor size, objective magnification and microscope adapter magnification.